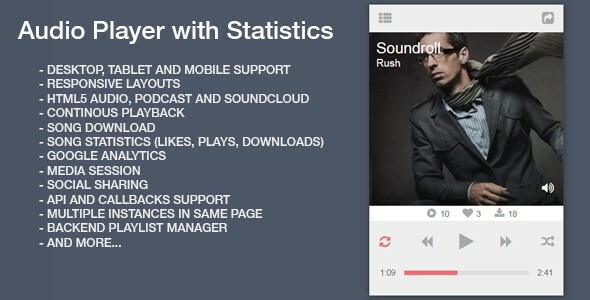 Audio Player with Statistics - CODELISTPRO | Free Premium Scripts, Plugins, Apps Source Code. jQuery Audio player with support for SoundCloud & Podcast music, Continous playback, Song statistics, Google analytics, Media session and more… Easy to reskin and modify with basic css. Comes with Backend playlist manager editor written in PDO mysql and datatables. Many demo examples included with download package.